Made from high quality durable aluminium, this 31031218 10 tread Builders stepladder is a reliable choice for professionals who need a ladder for frequent, heavy duty work. 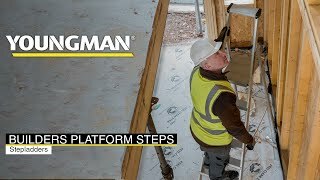 Features include a large platform perfect for standing on, top edge caps for a smoother profile, heavy duty internal spreaders and large slip resistant feet. Approved to the latest EN131 standard. For Professional Use.